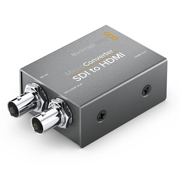 This Micro Converter accepts an SD, HD, or 3G-SDI signal and converts it to an HDMI signal while retaining the original image quality and resolution. An SDI loop output sends out a re-clocked SDI signal for connecting to other down-stream equipment. The converter's small size allows it to be placed nearly anywhere, and it can be powered via any standard USB power source, including separately available USB battery packs.